Gaza City, Sept. 9, 2009, (Pal Telegraph) It has been 9 months since the devastating War on the Gaza Strip, which left thousands of people either killed or wounded. Today I was invited to take a Ramadan breakfast in my friend Jumaa’s house. He lives in Al Maghzi Refugee Camp where people still are suffering miserably from the impacts of the War on their houses and streets. 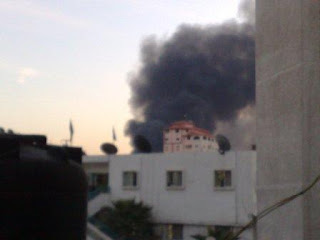 Basically, most of the residents of the Gaza Strip are already refugees and during the War they were once again forced to evacuate their houses and flee. I asked my friend to take me around in the camps small pass-ways, as I wanted to be closer to the people actually living there. 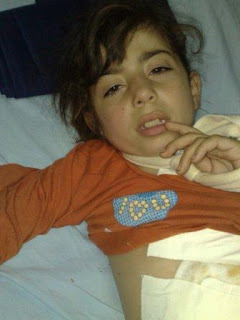 Indeed, this made me feel strongly how much the people in the Refugee Camp are still in real pain. In the middle of the Al Maghzi Refugee Camp there is still a completely destroyed building – impossible to ignore by the people living in the Camp. I found little children playing on the rubbles of this building which really made me sad. But THEY didn’t mind and seemed to be really happy. 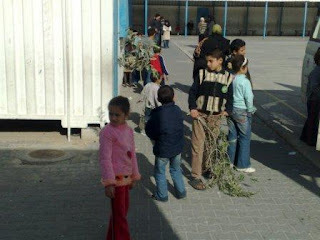 In this picture I saw little kids carrying branches of olive trees. 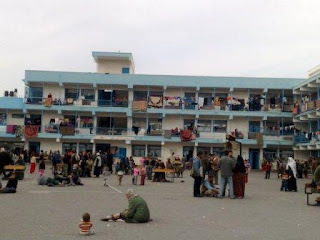 Those little kinds had to flee from their homes to one of the UNRWA school in the Al Maghzi Refugee Camp. I wished I could be there at that time to ask them why are they were carrying these branches? It is well-known that olive branches are a symbol of peace. It seemed as if those kinds were trying to convey a message from the hardship of their condition at that time. Kids of Gaza are still aspiring peace and stability - even in times of WAR!! !